Report on the 5th 3RINCs has been uploaded ! Once you click the following URL, you get the report. 3RINCs 2019 ; Deadline for abstract submission has been postponed again ! Rearding 3RINCs 2019, deadline for abstracts has been posponed to January 10th 2019 due to numerous requests. 3RINCs 2019 ; Deadline for abstract submission has been postponed ! Rearding 3RINCs 2019, deadline for abstracts has been posponed to Decmber 21 due to numerous requests. The first issue of our journal, JMCWM was published at the end of October, 1999, and the latest issue, Vol.19, No.1 has been published in Jan. 2017. Vol.17, No.2 was the 1st 3RINCs 2014 special issue of JMCWM. At the beginning we started to publish biannual English journal, and from Vol.11 it became quarterly. In 2015 JMCWM was obtained IF: 1.422 in Journal Citation Reports by Thomson Reuters. The submitted manuscripts should be significantly enhanced and updated from the original short abstract published in the proceedings of the 4th 3RINCs 2017. 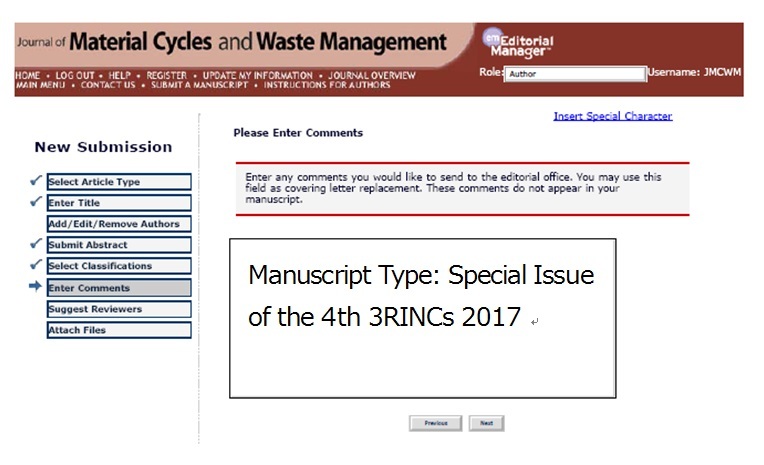 Please note that only manuscripts containing data and information beyond the material presented in the proceedings of the 4th 3RINCs 2017 will be accepted for publication. All manuscripts for the 4th 3RINCs 2017 special issue of JMCWM will be subject to follow standard rules and review process for peer reviewed papers; including the review of each manuscript by at least two international experts. The deadline for paper submission is extended to June 15, 2017 with no extensions. The accepted papers will be published at the end of April or July, 2018 (Volume 20). There will be no page charge for authors in the 4th 3RINCs 2017 special issue of JMCWM. Color illustrations will be accepted; however the author will be expected to make a contribution to the extra cost. Your specification to submit for the Special Issue of the 4th 3RINCs 2017 should be appreciated. Please mention thereon in space of Author Comments, as shown in the figure. Report about 3RINCs2017 India is uploaded! The report about 3RINCs2017 india by the committee is uploaded. Thank you very much for your contributions to the 3R International Scientific Conference (3RINCs), which were held every year from 2014. Conferences were very successful with approximately 350 delegates from around the world, and we are pleased to invite you to next 3RINCs, 4th 3RINCs in India. This will be held on 8-10 March 2017 at New Delhi. We opened the registration site and welcome all of you. Please register to get latest information. You can also check the preparation and photos through the facebook. We are looking forward to seeing in India. The waste problem in Asia-pacific region is a crucial issue influencing the countries all over the world. Establishing a material cycles society is one of the important vectors for solving this problem, and the catchword here is “3R (Reduce, Reuse and Recycle)”. Third 3R International Scientific Conference on Material Cycles and Waste Management (3RINCs) will bring top researchers in this field to exchange and discuss the related research results. Objectives: The aim of 3R International Scientific Conference on Material Cycles and Waste Management (3RINCs) is to provide, and serve as a platform for, academic activities that promote a 3R society. The first circular introducing the 4th 3RINCs is uploaded. To obtain the circular, please visit the following URL. We are delighted to invite you to next 3RINCs, 4th 3RINCs in India. This will be held on 8-10 March 2017 at New Delhi. We are looking forward to seeing you in India.